A new theatrical show, This Turbulent Priest, has been added to The Canterbury Tales’ programme of education packages, tailored for children above the age of seven. The play has previously been toured nationally, where it was reportedly highly praised by head teachers and recommended by the National Teaching Fellow, Dr Jonathan Barnes. The 50-minute show tells the story of Henry II and Thomas Becket’s troubled friendship, which resulted in the Archbishop’s brutal murder in Canterbury Cathedral. This Turbulent Priest is a two-hander performed as seen through the eyes of a pair of roguish medieval actor narrators. 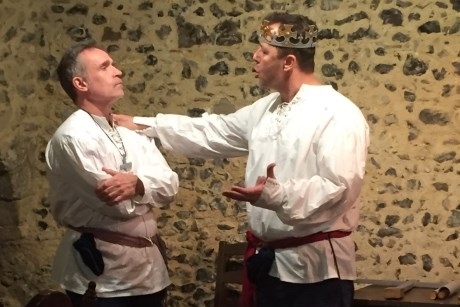 It is accompanied by live music and is performed at Conquest House, the very location where Thomas Becket’s four murderers robed and armed themselves before killing him in the most gruesome manner at Canterbury Cathedral’s east entrance. This Turbulent Priest is also reported to be historically accurate. Owned by Heritage Projects, part of Continuum Attractions, The Canterbury Tales is an immersive guided tour through Chaucer’s tales, allowing students to discover the sights, sounds and smells of medieval England. It represents an accurate reconstruction of 14th century England, set inside the former St Margaret’s Church. School groups are invited to learn about Chaucer and his band of pilgrims as they embarked on a journey from The Tabard Inn, London, to the shrine of St Thomas Becket in Canterbury Cathedral. The attraction ties in with curriculum subjects including History, English and Religious Studies. One adult with every ten children is admitted free in The Canterbury Tales, while one supervisor must be present for every 15 children. For additional information, opening times and prices, you can call 01904 261262 or email groups@continuumattractions.com. To book online, visit www.canterburytales.org.uk.